I'm sure I'm not the only one who struggles to have a productive day sometimes, especially when you're feeling a little under the weather and let's be honest, pretty crap. 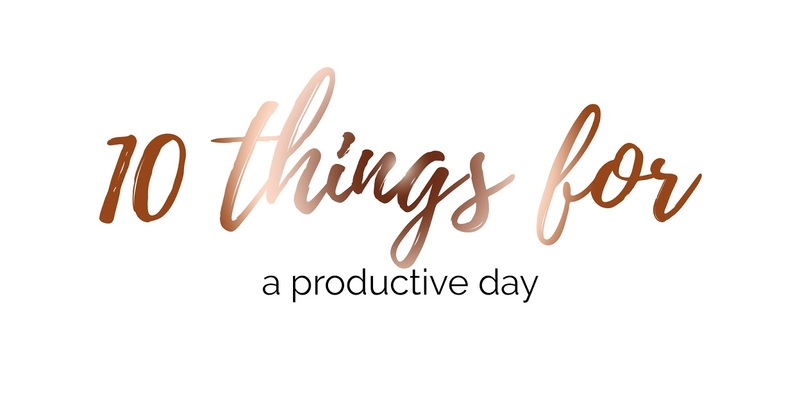 Today I'm going to share with you 10 things to do to have a productive day! They're so simple and don't take any hard work at all. As soon as you've got this into a habit, you'll never have to worry about slumping around the house again! Embrace your goals; create a to-do list every evening for the next day. Not only will your day become so much easier, but you'll become so much more organised too; leaving you with a productive and satisfactory day. Your attitude towards others determines their attitude towards you. Their may be a problem, but this problem isn't the problem; your attitude about the problem is the issue. Change your attitude towards everything and your life will change. Find the positive in every situation. Remember, the most successful people are the ones who keep on going, even when they want to quit. There's no gain without pain. Remember; quitters aren't successful and to keep on moving. Stick around likeminded people and throw out the people who bring the negativity into your life; you don't need them and by having these positive people around you, not only are they going to support you but you'll question why you didn't do this so much earlier on. Studies say it takes 21 days to create a habit. Start now, and you'll only have 20 days left until you no longer have to think about it; this process will be second nature and you'll do it every day. Keep moving forward, you've got this far and you can keep on going. Stressing over something or even someone? Accept that it's okay to let go and in the long run you'll be happier; so much happier. Everyday look at the goals you have set, now ask yourself if what you are doing today is getting you closer to where you would like to be tomorrow. Is it a smart goal? If your goals aren't going to get you closer to where you want to be tomorrow, change them. Keep your goals smart. Wake up an hour earlier and start getting everything done as early as possible; the earlier you get everything done, the more jobs you can fit in! Having a good night's sleep is the best way to have a productive day the next day. If you're exhausted, you won't do anything and you'll slump around all day! Turn social media off an hour before you go to bed and take some time to wind down before going to sleep. We all know coffee gets us through absolutely everything, so grab a mug, make yourself a coffee and crack on with your to-do list. What do you do to have a productive day? These are really good tips! I agree with them all, especially waking up early. I found if I wake up at nine o'clock rather than eleven, those two hours make soo much difference! When I wake up in the morning, I always write a list of things that I need to achieve for that day and the next couple of days. This is soo helpful to see where my day needs to go. Rather than trying to figure it out without writing it down and forgetting something! Yes! I need to be keeping this post in mind! I always get distracted and will be trying out a few of these tips when it comes to writing up uni work! I couldn't agree more with working harder, not smarter! Realistically you can only concentrate for about 20 mins so it's much better to work hard for 20 mins rather than working half-heartedly for about an hour! I'm trying to surround myself with more positive people atm as well, such a great step!